Barwalia's Blog: PROPELLER VISION: An application of the phenomenon, "PERSISTENCE OF VISION"
PROPELLER VISION: An application of the phenomenon, "PERSISTENCE OF VISION"
it was the most fascinating project for me, now i would like to share the fascinating experience with you. the PROPELLER VISION is based on the phenomenon called PERSISTENCE OF VISION. and if you are not clearly aware of what is exactly persistence of vision, please go through this link , because this is the fundamental idea that you must be having for to go ahead with this project. as the name suggest, propeller is consist of array of LEDs, when it starts rotating and LEDs starts blinking in such a fashion that its end up giving you the sense of vision. 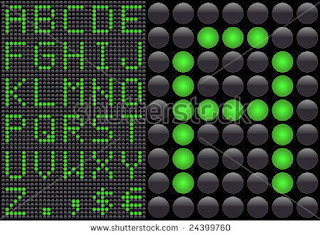 here the major question is, how the array of 8 or 12 LEDs can be able to represent a letter or word??? yes it was the 1st question that came into my mind when i thought about this project. while doing this project keep one thing in mind that, this project is all about what you see and its not about what actually happens. and thats why it is restricted to normal humans and not for those super natural creatures who are having a very low timing(in micro seconds) for retaining an image in their retina. if you are not understanding what i m talking about here, you will soon be able to understand, just be patient!! here you can see, if you have a board of LEDs consist of 35 LED. you can easily show any number or alphabet. here no. of columns for each alphabet is 5 and no. LEDs in 1 column is 7. 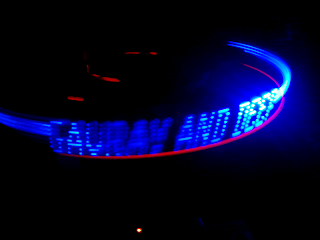 In my case it was somewhat different, i choosed 12 LEDs and 9 columns. (i) Microcontroller board: this one is the heart of this project, what it really does is, it provides very fast switching of LEDs that can never be done manually. diode, switch, resistors,capacitors of suitable values. 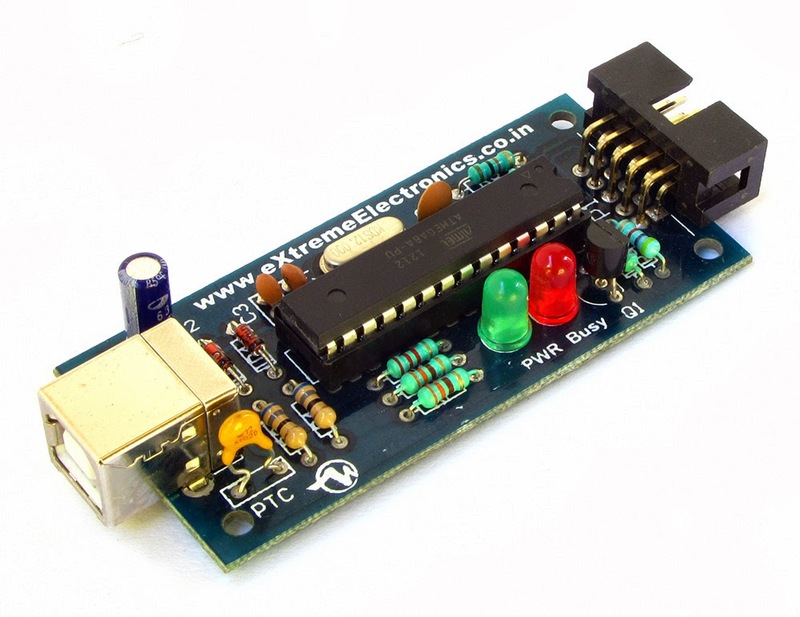 you can either make your own board or purchase one and it will be a good idea for those who are not familier with microcontrollers to purchase one.these are easily online available, one of the online service i used is this. (ii) IR sensor board: it helps to indicate the complition of one revolution. it's output is very important bacause program repeat itself after each revolution. or you may simply use emitter , receiver nothing else. and if you are not good at the calculation of resistors for LEDs, then visit this page. (iv) MOTOR: it is the 4th imp part, i used induction motor bacause it's easy enough to use. As far as power as the power supply in the running mode is concern, its entirely upto your ease of operation. now its time to understand the whole process of working, it starts with the power supply, use an adaptor of 12v DC(or any, its upto you) which gives power to your microcontroller board, your board having an voltage ragulator(7805) which steps down the voltage to 5v DC. now u have VCC supply of 5V for your microconcontoller. 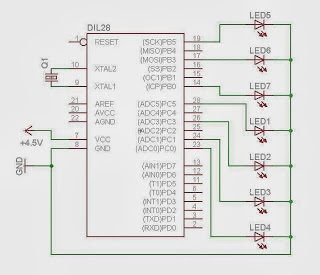 now select the appropriate pin for input of IR SENSOR and appropriate ports for output of LEDs in the microcontroller. now its time to calculate TIME DELAY, which is the most important calculation that you need to do prior to programming. 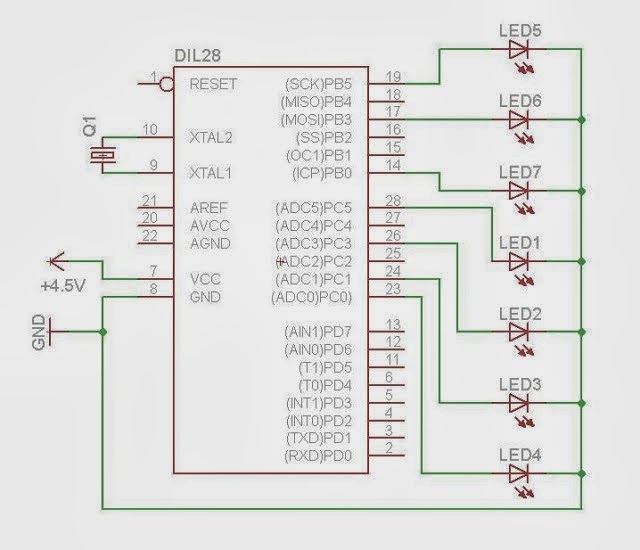 in our arrangement we have an array of LEDs which makes only one column, but for showing a letter or a number we need here 9 columns(in my case) , each letter having some width hence each column having some width, that width is nothing but the duration of time for which the LEDs are ON. so TIME DELAY is the duration of time for one column. suppose you are using an external crystal of 16 MHZ as a clock, then no. of cycles in 1 sec=16000000. so, no. of cycles in 239 micro sec= (239*16000000)/1000000= 3824 .
now we have calculated time for each column , so space between the letters can also be given by giving delay of 2 or 4 columns its upto you, and here the space means all the LEDs are OFF. here the RED circle in center is due to the LED in the microcontroller board, which is always ON. now its time for some programming..
after burning this program , it will show three letters... E M I.
i choosed these letters you can choose any. here you can see i used delay cycle of 4500 instead of 3824 , because it was suitable for me, calculations are just the approximations, in reality you need to adjust some values. it was the joint effort of me and my partener.. hope it was helpful to you. or you can leave your comment here. I am GAURAV BARWALIA, from india, born on 21st august 1991, student of electrical and electronics engineering at BIT MESRA, RANCHI,INDIA. i just love making things. Copyrights: GAURAV BARWALIA . Simple theme. Powered by Blogger.